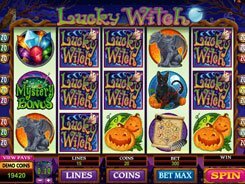 Developed by Microgaming, Spooks and Ladders is a Halloween themed three-reel video slot populated by ghosts, vampires, spiders, bats and other spooky creatures that are everywhere on the reels, on the background image and in the bonus feature. 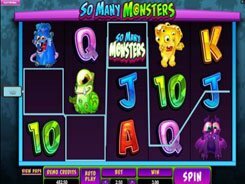 The slot is played over a single payline that accepts $0.1 to $10. 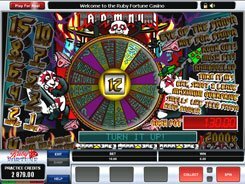 The most interesting thing about the slot is that it does not award you instant cash prizes when you spin the reels, instead granting you access to a bonus feature with guaranteed payouts. When hitting a combination formed by three identical symbols, you get a certain number of dice rolls (3 to 9). You are then taken to the second screen that shows a 6x6 field with ghosts and ladders on it. 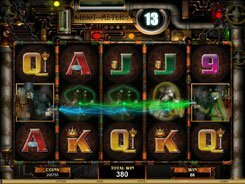 You use your dice rolls to move through the board and earn cash prizes until all dice rolls that you have earned are exhausted. 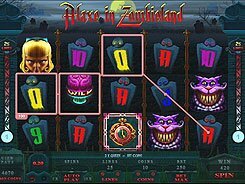 The highest payout that can be won in the bonus feature is x2000, or $20,000 if playing at max. 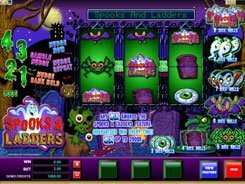 Sticking to a classic 3-reel format, Spooks and Ladders still feels unique leaving a lasting impression whenever you are playing the slot. PLAY FOR REAL MONEY!